Julie Vanderblue of the Vanderblue Team, an affiliate of Higgins Group Real Estate, with Brett Ciarlo, an agent with Christie's International Real Estate in New Canaan, at a Greenfield Hill estate on Congress Street in Fairfield, where Vanderblue hosted a reception Sunday after a tour of luxury houses to raise money for Operation Hope. The owners of some of Fairfield County's prime real estate loaned their luxury accommodations to a local real estate agent and her team Sunday to help the hungry and the homeless. 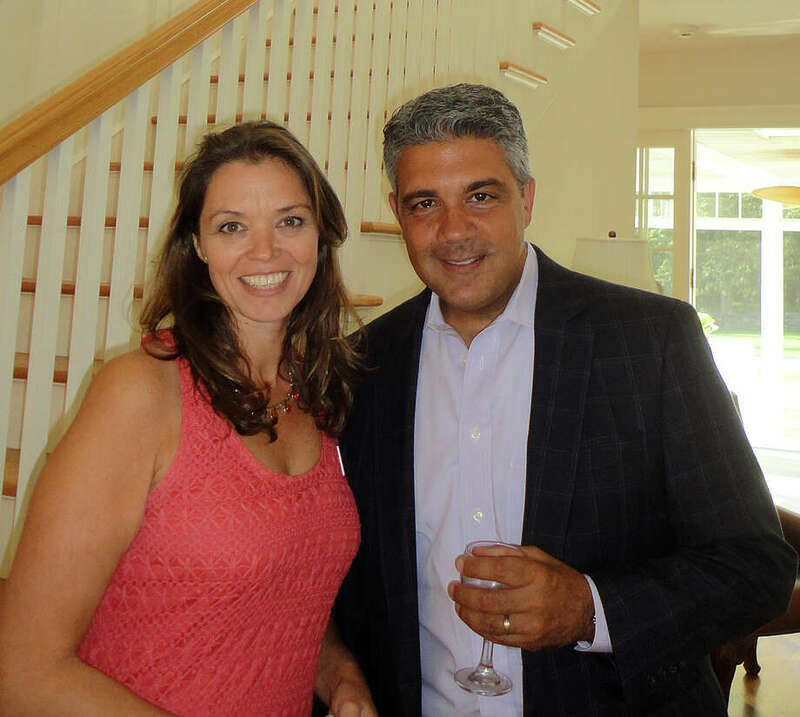 Julie Vanderblue, president of the Higgins Group, a Christies International Real Estate affiliate, and CEO of Vanderblue Associates in Fairfield, hosted the Luxury Home Tour, to raise funding for Operation Hope. The Fairfield-based non-profit organization runs a community kitchen, food pantry, shelters for homeless men, women and families, and a transitional housing program. The tour included 14 estates from Greenfield Hill in Fairfield to Greenwich, including the Westport Mediterranean-style home of multiple Grammy Award-winning singer/songwriter Michael Bolton and the 23-acre estate of a feature film colorist, whose name was not disclosed. Bolton's two-house waterfront compound on Nash's Pond was of particular interest and seemed to attract the largest crowds. "We wanted to see how he lives," said Bill Geils of Trumbull, who went on the tour with his daughter Brittney. He said his favorite Bolton song is "When a Man Loves a Woman." "It's cool that he lives so close to us," Brittney said. "I like this," she said as she walked across Bolton's terraced marble patio and looked around at his English garden, in-ground swimming pool and tennis court. They also got a peek at Bolton's music room, living room, chef's kitchen and the lower level rooms, which were lined with his gold and platinum records, magazine photos, and music awards. The second floor was off limits. Theresa Roth, a realtor on the Vanderblue Team, said Bolton was immediately on board for providing access to his home "as soon as he learned it was for Operation Hope." In fact, he donated to the silent auction a lunch and tennis date with him at his home for the winning bidder. The day concluded with a reception at "The Hill House," a 10-acre estate at 3236 Congress Street in Fairfield, which attracted about 125 people. "This is spectacular. I've driven by it so many times and wanted to see it inside. Breathtaking," said Kathleen Flynn of Fairfield, of the estate which features the main house, care-takers or guest house, party barn, formal gardens, in-ground swimming pool and a pool pavilion with an outdoor fireplace and kitchen facilities. "It was a great day weather-wise and Operation Hope is key to the community," said Flynn, who also toured other properties. Vanderblue could not say how many people took the tour because only four properties required an admission ticket. Others were open to the public without charge. Vanderblue said 100 percent of proceeds from ticket sales and auction items will go to Operation Hope. "Many people just don't realize that 33,000 people in Connecticut were homeless last year, half of which were children. Every dollar helps ... There's strength in numbers and we want to combine our efforts as a team, not just with real estate but in helping change people's lives, especially those in need," she said. Carla Miklos, executive director of Operation Hope, said she is grateful to Team Vanderblue because the tour created a "wonderful opportunity for people who have plenty to remember those who do not." She said the tour presented "an interesting correlation between high-end real estate and people who are hoping to secure a stable home for their family." "I hope to target the proceeds, in part, to offset the cost of a security deposit for a formerly homeless person to move into their own apartment," she said. Miklos said the Vanderblue donation may also be used for winterizing projects at the agency's shelters for men and women. She said there is a whole wish list of projects and programs for which donations can be used.